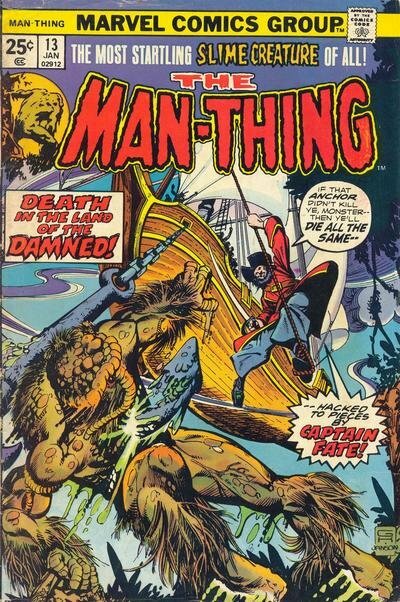 Click Here To See Man-Thing #13 Comic Book! Check out this very nice 1974 Man-Thing page, which was penciled by the great John Buscema, and inked by the great Sal Buscema, from the story titled: "Red Sails at 40,000 Feet!" This nice page features Man-Thing battling bad guys on a ship. The detail on this page is quite amazing! Page is signed by John Buscema in ink at the top also. A great opportunity here to own a nice 1974 John Buscema / Tom Sutton Man-Thing page!